Besides the Ranking and Rating list provided here I will also prepare this week the Monthly Currency Score list which will support my analysis for trading in the coming month. When looking at the Top 10 in the Monthly Ranking and Rating list we can see that for the coming month the following stronger currencies are well represented for going long: NZD(4X) followed by the USD(3X). The weaker currencies are the CAD(4X) followed by the GBP(3X) and the EUR(2X). Analysis based on TA charts for all the major currency pairs. Good luck to all. No advice, just info. Every month the Forex ranking rating list will be prepared at the month change. All the relevant Time Frames will be analyzed and the ATR and Pip value will be set. The monthly articles will be published during weekdays only. When the 1st of the month is on Monday, Tuseday or Wednesday the weekend before will be used for creating the models. Otherwise the weekend after will be used. Reason for creating the information in the weekend is because the Weekly close is more important than the daily close. 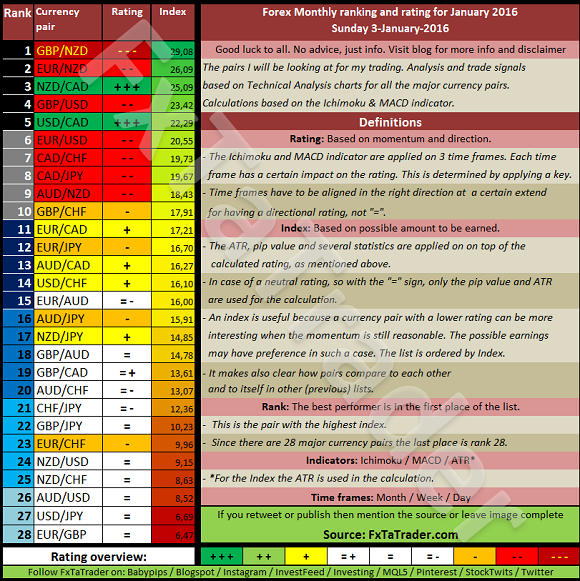 The Forex monthly ranking and rating list is meaningful data for my FxTaTrader strategy. Besides this list I also use the Monthly Currency Score which is also available once a month on my blog at FxTaTrader.com. If you would like to use this article then mention the source by providing the URL FxTaTrader.com or the direct link to this article. Good luck in the coming month.